HRH Prince Leonard is proud to announce that a new team has entered the realm of representing the PHR in international sport, the Royal Hutt River Eagles! Here in the Principality we are excited about the team and it's future prospects in competitions. As is normal all for PHR sports, the teams primary aim is to bring honour in the chosen sport of competitive shooting to the Principality of Hutt River and all team members that represent her. International Practical Shooting is dynamic, challenging, and one of the fastest growing shooting sports in the world today, shooters need to balance accuracy, power, and speed as their score is derived from these. Multiple targets, moving targets, targets that react when hit, penalty targets, or even partially covered targets, obstacles, movement, competitive strategies, and other techniques are all used to keep shooters challenged and spectators engaged. The typical course of fire is an array of targets, which the competitor must engage with two hits each (sometimes more). Also, steel plates that fall when struck can be added to a course of fire, or stage. The shooter's time is recorded electronically, by means of a timer that detects the sound of the shots. Scoring is relatively simple to explain, but involved to calculate for a match. The points generated by hits on the targets are totalled. Penalties (if incurred) are subtracted. Then the points total is divided by the time it took the competitor to engage the stage. This calculation, called a "Hit Factor", is the ratio of points per second. The highest hit factor wins the stage and the full total of Stage Points assigned to it, and lesser scores are awarded Stage Points according to the percentage hit factor they fired, compared to the winner. The points from shots fired and hits generated vary slightly. A centre hit for both Major calibre firearms and Minor calibre is five points. However, lesser scoring rings are not rewarded as much for Minor as for Major, this is due to people shooting in the major catagory having to deal with more recoil of the firearm. The A-C-D rings on the target are scored 5-4-2 for Major, and 5-3-1 for Minor. A shooter who has declared Minor must shoot more "A" hits or shoot faster than one who has declared Major, in order to make up for lesser hits. Each competitor then has his/her stage points totalled for all stages of the match, to calculate the match standings. The highest total of points wins the match. Comparing each shooter directly to the performance of the top shooter of each stage allows for precise gradation of performance across a match, but requires a computer and software to do in a timely fashion. The Royal Hutt River Eagles Team compete in both team and individual competitions, the sport being governed by the International Practical Shooting Confederation (IPSC). 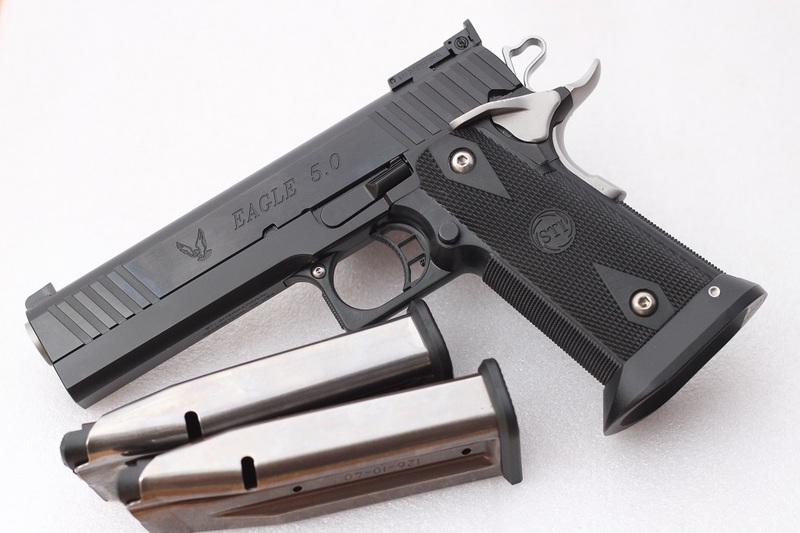 Handguns used are Eagles STI .357sig ammunition, 2 of the members handguns are pictured below. The Royal Hutt River Eagles is up and running with many medals already earned and the PHR Flag flown high and proud over a number of ranges already by the formation members shooting in Western Australia. A second branch of the RHR Eagles is also forming in Croatia with the entry into the team made by Sir Zeljko Riha, the PHR High Representative to Europe and the Balkans as well as Inspector General in the RHR Diplomatic Security Force. We will hear more of Sir Zeljko's exploits in competition once he gets underway. Keep returning to this page as we will be publishing more information as it comes to hand. Updates, reports and photo's of all competitions the teams enter into will be published as the information comes to hand. We hope all will join with us in wishing this new team all the best in their sporting endeavours representing the Principality of Hutt River. National Titles in Darwin N.T.